A quick view of the most influential metrics in Lenox Place. In the close-knit community of Lenox Place, residents proudly display “Lenox Place - A Creative Community” porch banners and regularly gather for block parties, ice cream socials, Christmas caroling, and other neighborhood events. Lenox Place offers parks (Adair Park and Corley Commons), churches (St. Thomas More Catholic Church, Christ Covenant MCC, and Atlanta Friends Meeting Quaker Church), historic landmarks such as the Mary Gay House, fitness opportunities (Core Body Decatur and United Tae Kwon Do), a cozy neighborhood pub (Thinking Man Tavern), and St. Thomas More School, as well as a mix of historic single-family homes, apartments, and condos. All of this is located on the west side of the city, within an easy walk to Decatur Square and all of its amenities. 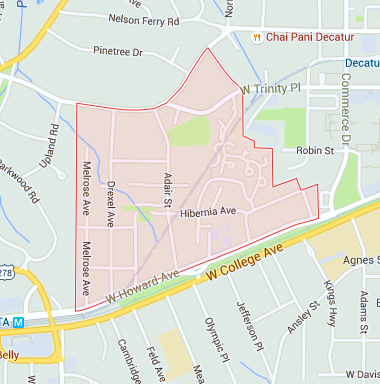 View our selection of available properties in the Lenox Place area. Check out the latest demographic information available for Lenox Place. Learn more about schools near Lenox Place complete with ratings and contact information. Browse through the top rated businesses in the most popular categories Lenox Place has to offer.